On Monday, January 30, 2012, an Ice Climber fell approximately 30' from a climb off of Rt 214. He sustained a broken leg from the fall. No other life threatening injuries were reported. With warmer weather, the ice has become unstable in some areas. It should also be noted that Climbing Magazine posted an article about the Catskill Mountains being a nice hidden place for ice climbing. Local ice climbers feel that the Catskills are too crowded. Many waterfalls in the Catskill are rarely known. Overall there are about 150 waterfalls in the Catskills. There are also some larger waterfalls that are virtually unknown to the public. 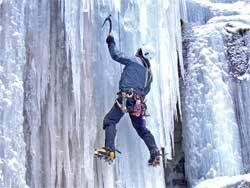 Most ice climbing in the Catskills occurs in the Kaaterskill Clove, Rt 214, and Rt 42. It should be noted that the ice climber in the picture was not the person who was injured.